Safety is the number one priority. Buildings can be replaced by not your life or health. If you have a medical condition that can be complicated by hard work, you should not be involved in the filling, handling, or laying of sandbags. Wear the proper gear and clothing. Dress appropriately for the conditions and wear basic protective gear. Dress for the temperature, closed toe and heel shoes, work gloves, proper head gear, eyewear, and reflective gear or light colored clothing if working at night. Always stretch and use proper technique. This will help prevent injury. Pace yourself depending on your physical condition. If holding bag- Make sure you stand feet shoulder width apart and knees bent. You can also sit or kneel. It is recommended that this volunteer wears eye protection. If shoveling- Keep your feet wide apart with the front foot close to the shovel. Put your weight on your front foot when you dig the shovel into the fill. Turn your feet instead of twisting when releasing sand into the bag. Lifting-Lift with your legs. Keep your back straight, tighten your stomach muscles, and bend at your knees. Don’t twist to change direction, keep your toes before your nose (move your feet). Laying and passing bags- Gently hand off the bags. DO NOT throw or toss bags, this could cause injury to yourself or others. 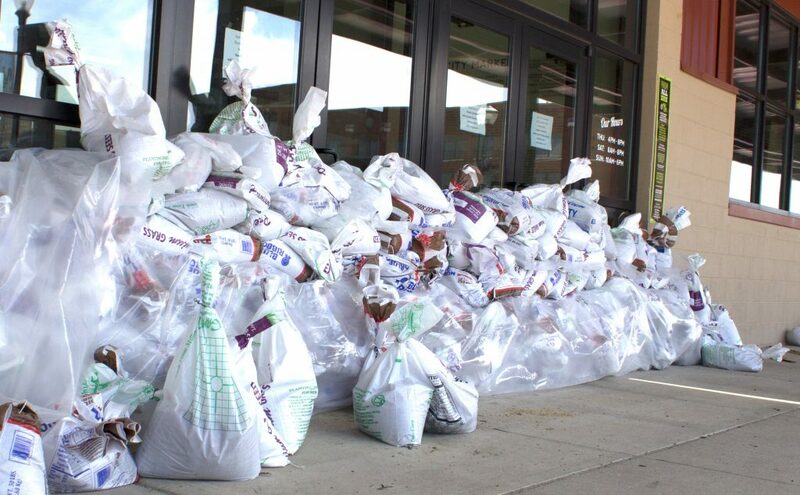 It is recommended that the line of volunteers passing sandbags alternate the way they are facing (‘,’,’,) rather than stand side-by-side and twist to hand off bags. If you have to stand side-by-side make sure you move your toes and reduce the amount of twisting. Be aware of your surroundings. Be wary of heavy equipment and trucks. Also the ground could be slippery or unstable, so watch your footing. Rest and drink water. Rotate jobs and take breaks to avoid overexertion and injury, and always drink water. Avoid touching your face, eyes, and mouth. Sand and flood water are dirty and contain bacteria, so avoid contact with your eyes and mouth. Always wash your hands before eating or drinking. Avoid walking or driving in flood water. The force of the water could sweep you away. There also may be unknown hazards in the water that you cannot see. Be prepared to evacuate. Be ready to move to higher ground, as rapidly rising waters or a breach in a levy can cause dangerous situations.